When it comes to projects there’s almost nothing I love better than repurposing something… giving it a new life as something completely different. 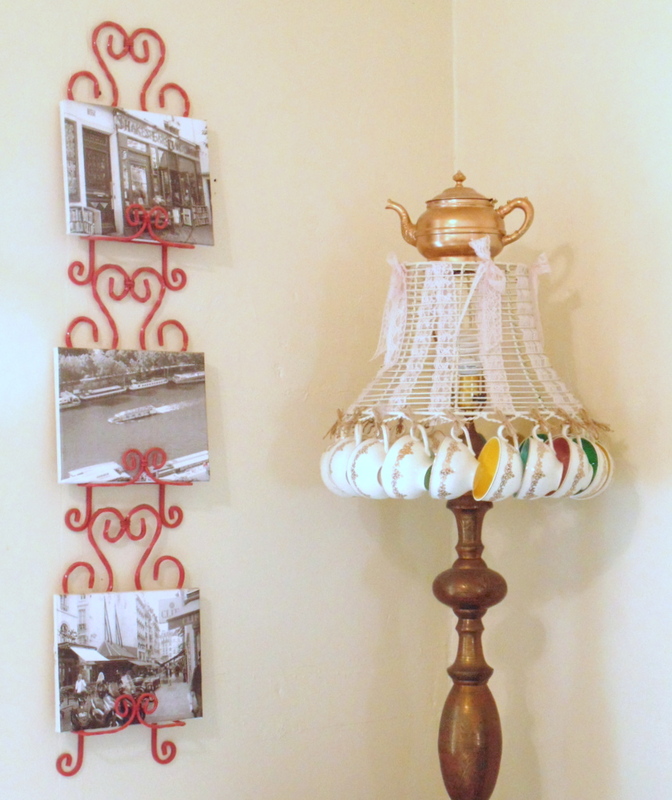 I think it’s really important to have a little fun and whimsy in your home’s decor…. things that make you smile, and maybe even chuckle a little, every single day. 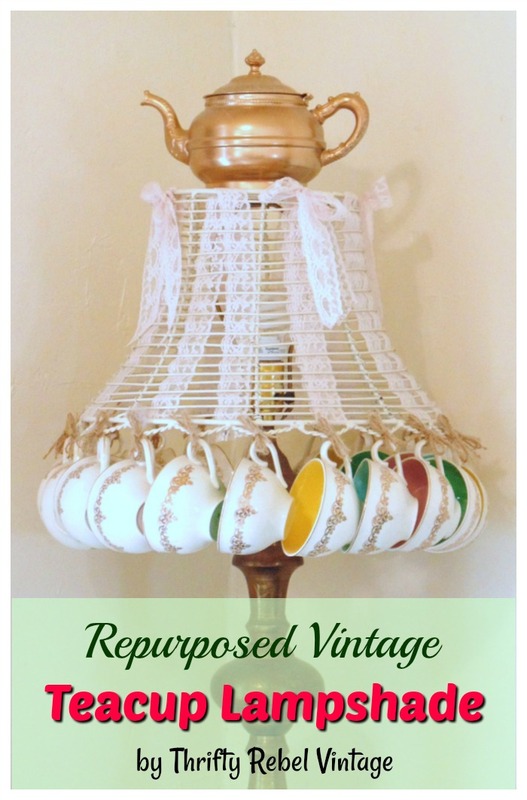 Wait until you see the awesome teacups that I used for this lampshade! I’ve never seen anything like them before. Keep reading and you’ll see what I mean. 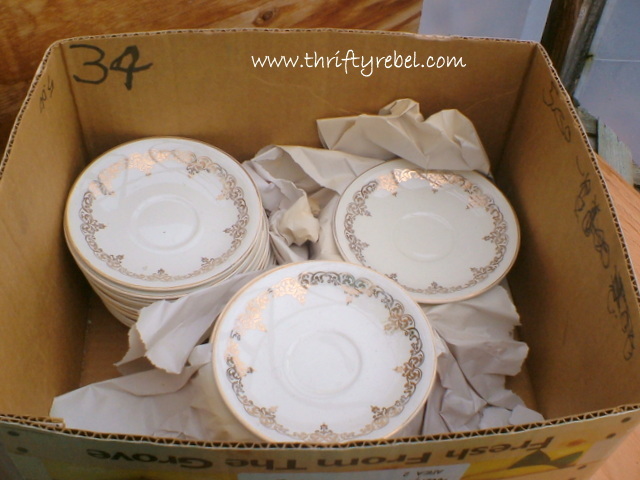 When I saw this box of 34 vintage teacups and saucers at my local thrift store for $2… (yes I kid you not) how could I possibly resist? 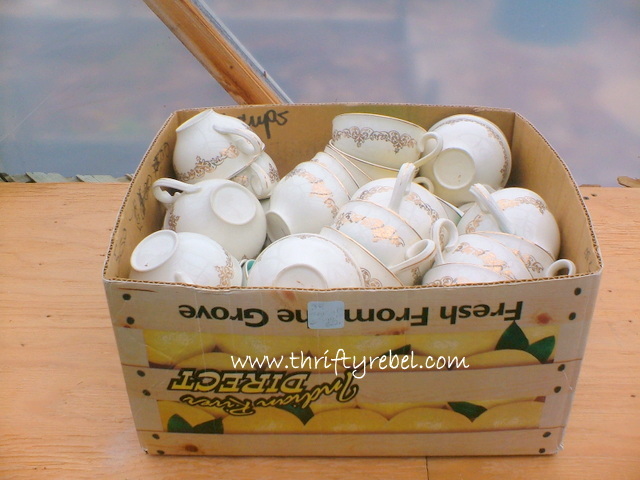 Well… time passes fast, and several months later that box of teacups was still sitting in my greenhouse/studio. Aren’t the colours fabulous? And so unexpected! Sometime in the future I’ll have to think about what to do with the 34 saucers. 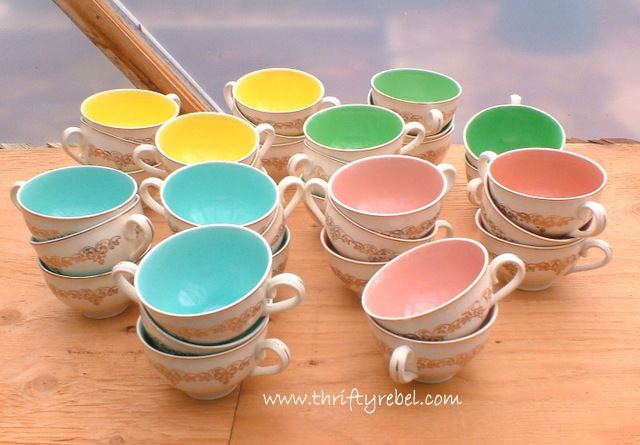 But for now … it’s all about the teacups. 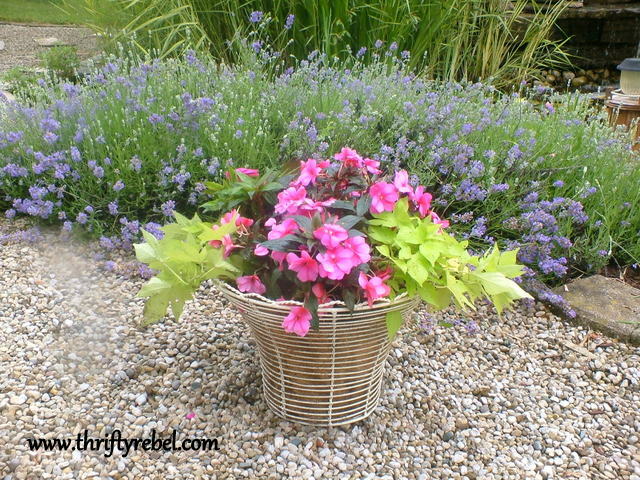 Also in my greenhouse I had this set of thrifted ivory coloured planters. They look delicate, but they’re made out of heavy duty metal and are very strong. They passed Miss Pixie’s inspection. 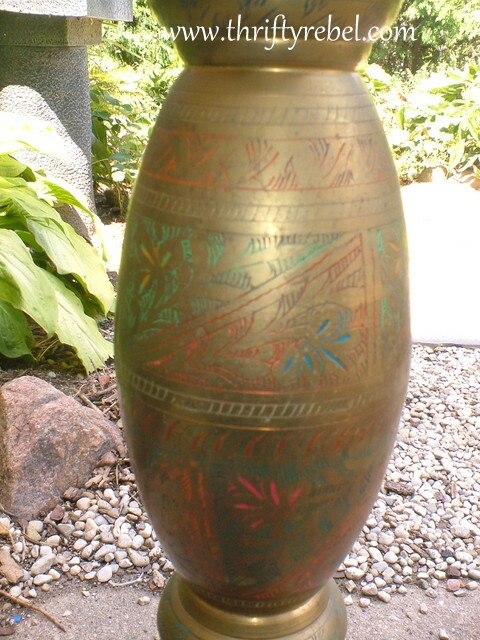 Here’s what the larger one looked like this past summer. I tried the larger one on the lamp for size and it fit beautifully. 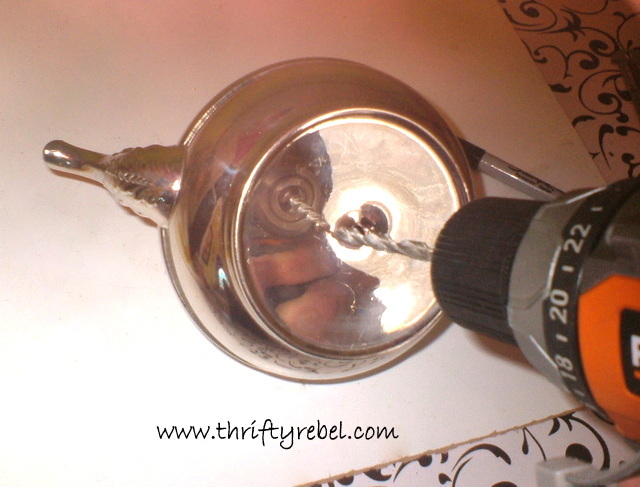 …borrowed the guest room lamp base because I needed something to hang the lampshade on while I worked… and I started tying. 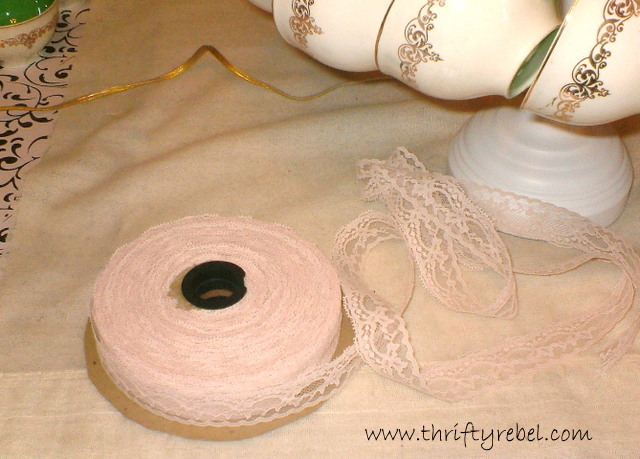 Each one double knotted… finishing with a little jute bow, and changing sides as I went along to keep it all from tumbling down. 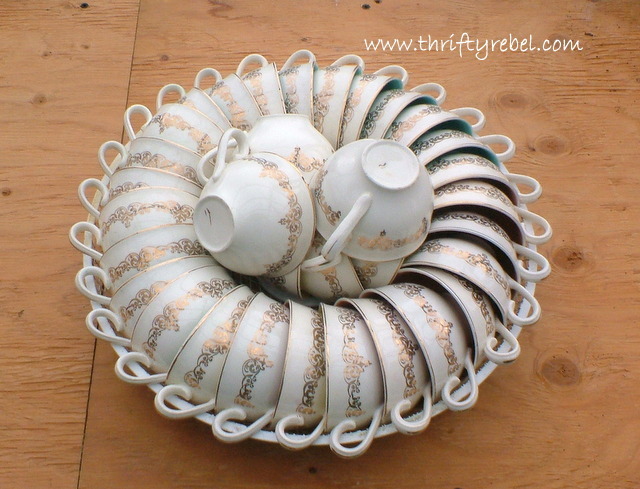 Here it is with 20 tied teacups. 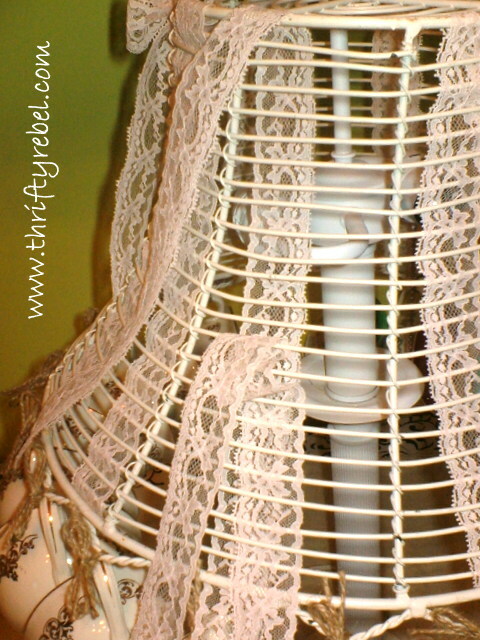 The next day I hunted through my stash for a roll of thrifted lace, and wove it through the heavy wire slats. I alternated how I did each section because I thought 8 bows at the top would be a little too much. 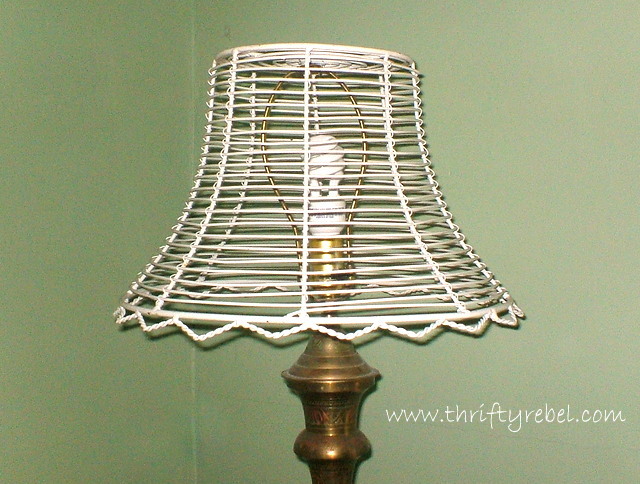 The lace is just to lessen the glare of the light bulb a little. 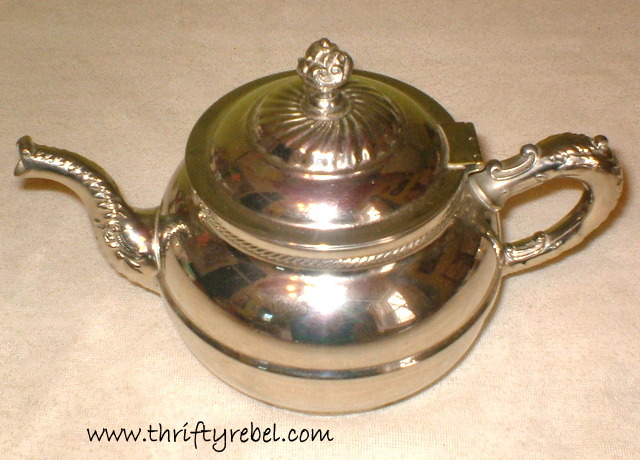 It was still missing something so once again I dove into my stashes, and I came up with this silver toned tea pot. I drilled a hole through the bottom, starting with a small metal bit and working my way up to slightly larger bits until my hole was just the right size. 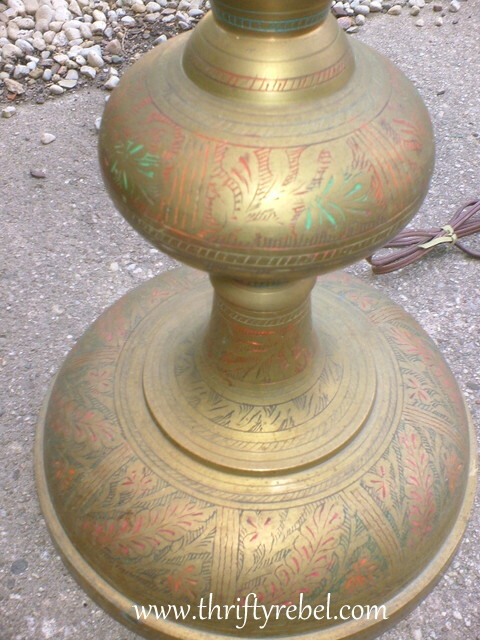 I spray painted it gold, and put it in its rightful place on the top of the lampshade. The lamp finial is screwed on inside the teapot. 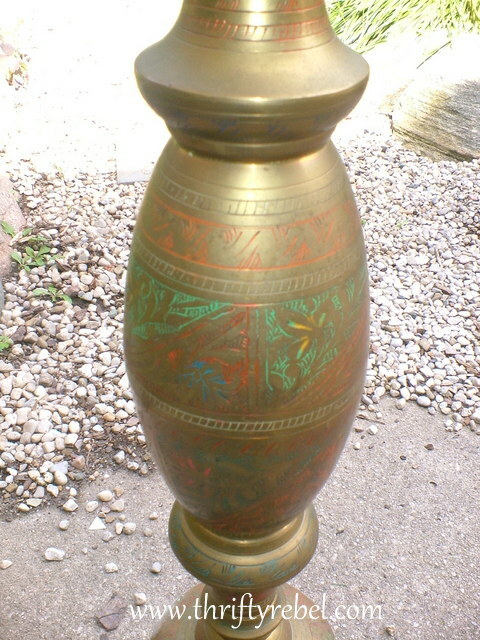 Here are some pics of the brass lamp from when I thrifted it last summer. But I wasn’t sure if I was going to keep it. 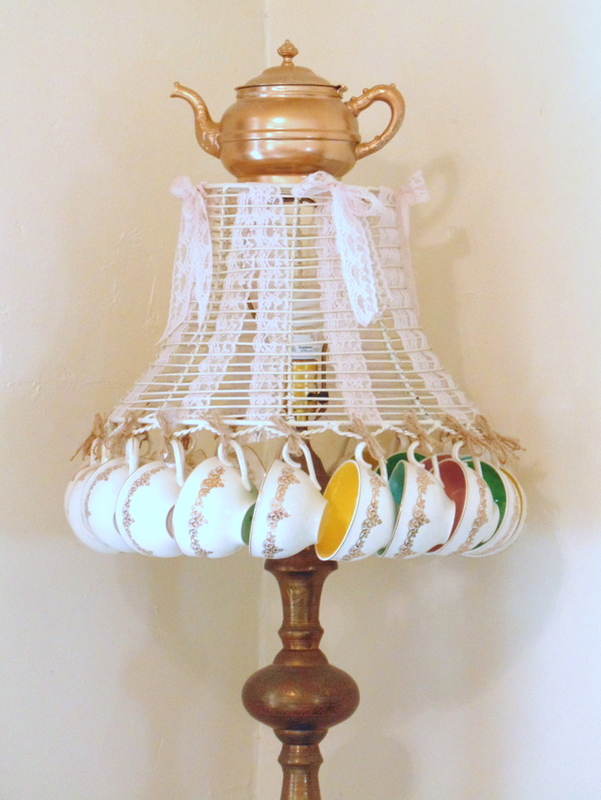 Here it is with its ‘Wonderland’ lampshade… complete with teacup fringe. It sits in a corner in my master bedroom beside my spray painted plate holders, which are holding my decoupaged photos on canvas frames. 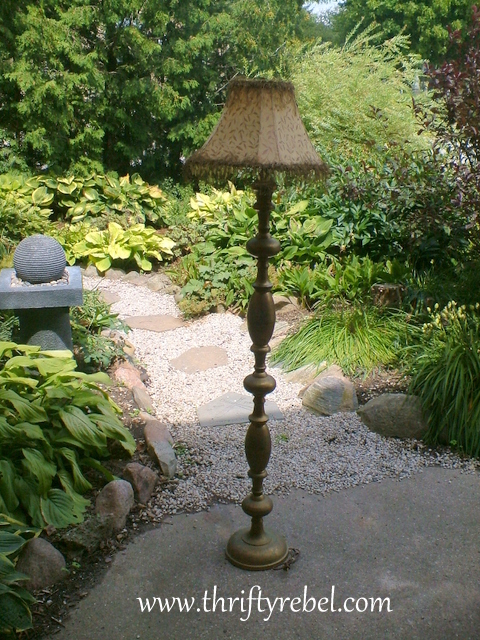 This lamp may not be everyone’s cup of tea, (sorry but I couldn’t resist, lol), but it’s mine. And it is most definitely a keeper. It makes me smile every single day, and I hope I’ve inspired you to make something fun and whimsical that makes you smile. Please share on your favourite Pinterest board! 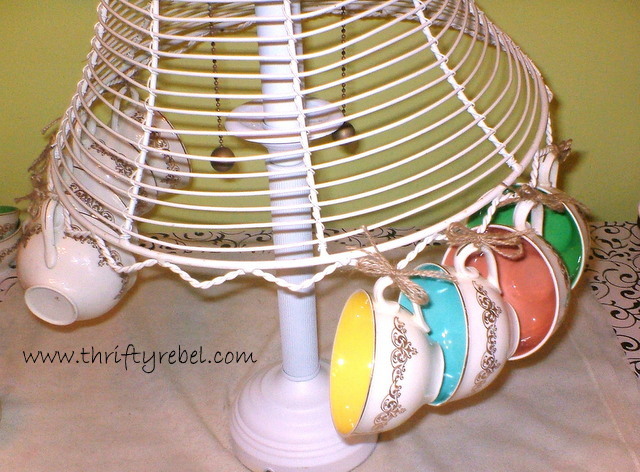 I still had 14 teacups leftover and I used some of them to make this vintage teacup pumpkin. 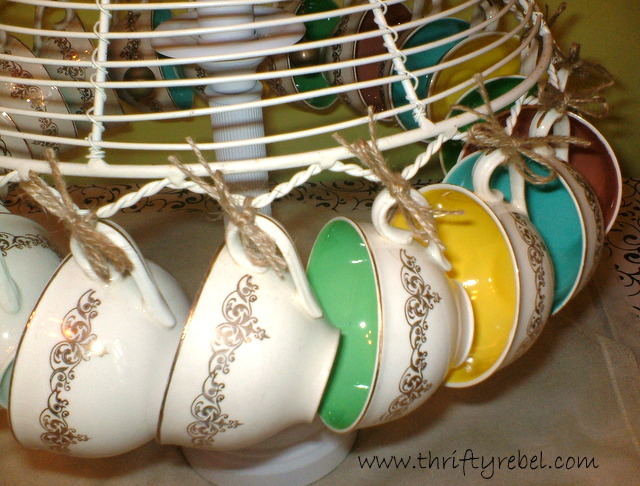 If you enjoyed this teacup project you’ll love these too. 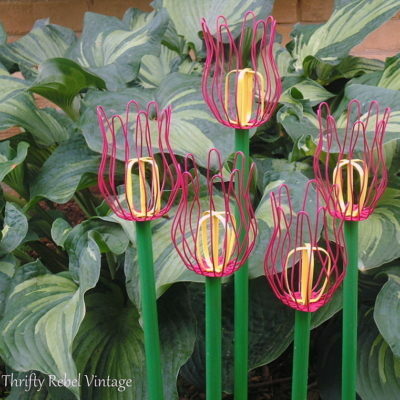 Check them out, and spread some whimsy somewhere today… and smile! 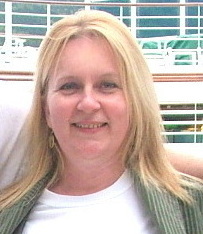 Thanks so much Roxanne! 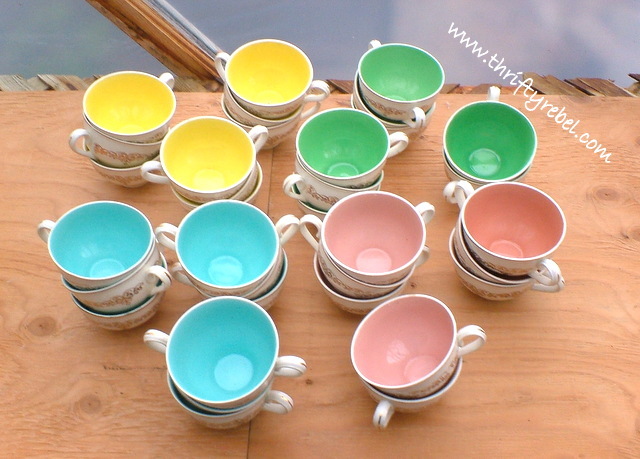 The teacups came looking just like that, in those beautiful colours. I couldn't believe it when I saw them. I was so lucky to find them. This was such a fabulous project Tuula! It will be featured everywhere!!! 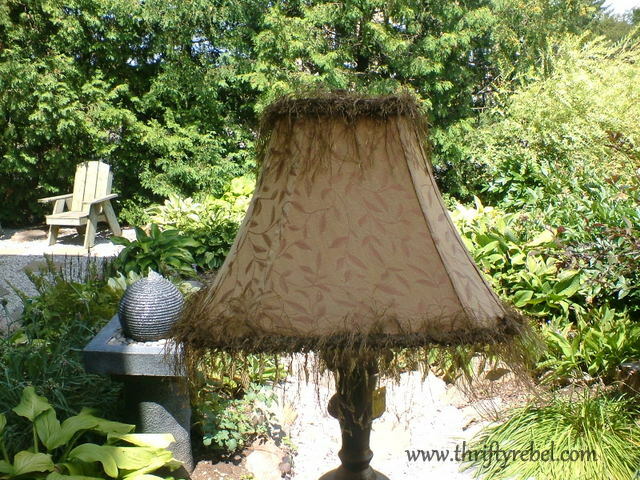 Only you could turn a planter into a lampshade and make it work!! I am still in love with those teacups. Enjoyed going over how you put this lovely lamp together and the fun you had creating each part to music. We're always young at heart with that inner youthfulness ready to jump out at any moment. Sometimes I have to tame myself from getting carried away! That's unique, clever girl. I love the tea cups. 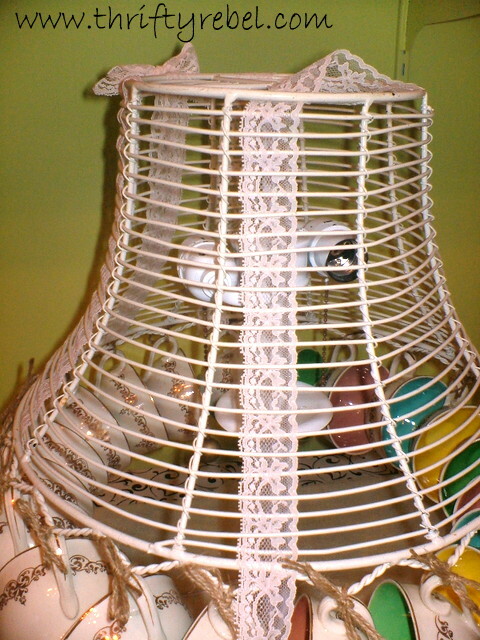 I'm Connie at http://hotflashncraftn.blogspot.mx/, a new GFC friend, I popped over from Ivy and Elephants to see this awesome new lamp you made. Thanks for sharing it. I was questioning my sanity for a moment. I knew I had seen your beautiful lampshade and then it hit me, Ms. Junkin' Jewel! I still love it and hope soon for a post about the saucers. Tuula…where do you come up with these genius ideas?!? Awesome! 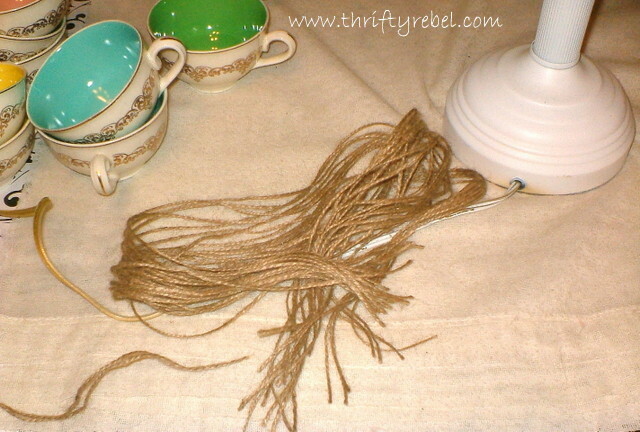 This is so cool… and using hooks instead of jute, it would make a wonderful storage option! 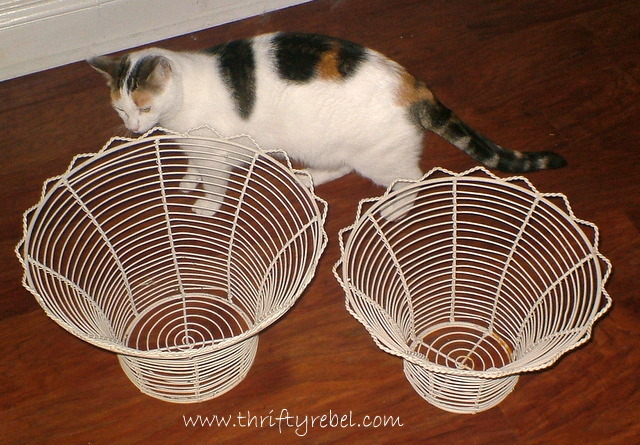 Such a very creative idea. Amazing! I'm still jealous of those tea cups and your lamp is beautiful! I love this post! And I relate to every single song you were listening too! Although when I create it has to be quiet or I mess up!! 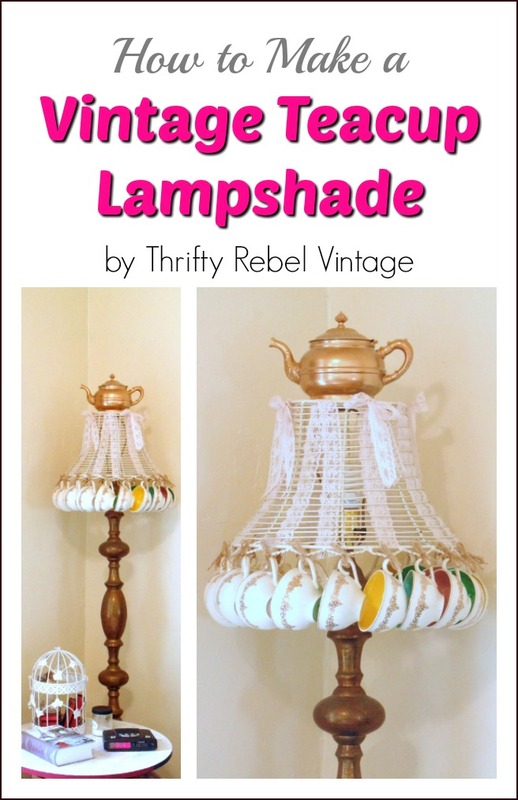 Your inner child did a fabulous, creative job on that lampshade. 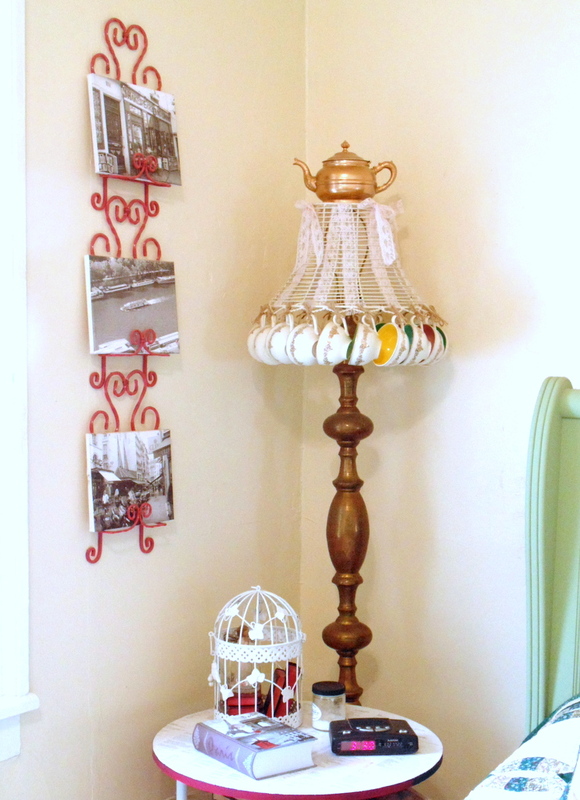 I pinned it to my "I've Got To Fix My Lampshade" board where I am gathering ideas for a lampshade I want to fix! Visiting from A Bouquet of Talent! what a totally fun and unique idea! love it 🙂 Can't wait to see what you do with the saucers! I love the insides of the cups! & I love the originality of your post! That is lovely Tuula! I love everything about it! Thanks Florence! 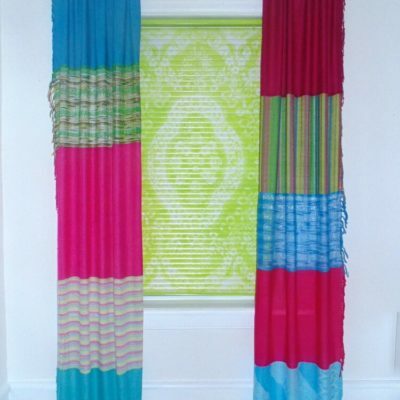 This is one of my favourite projects that I’ve ever done, and I use it in the master bedroom. It’s one of my favourite things! 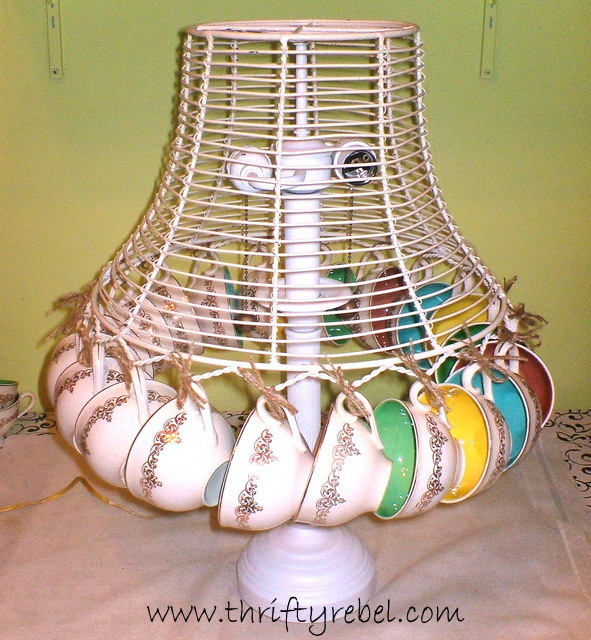 Tuula, I just saw the teacup lamp and I know I’ve said it before, but I have to keep saying you are one of the most imaginative thrifters I have ever known!!! The colors in the cups and the colors on that lamp base are a perfect match!! Just loved it! 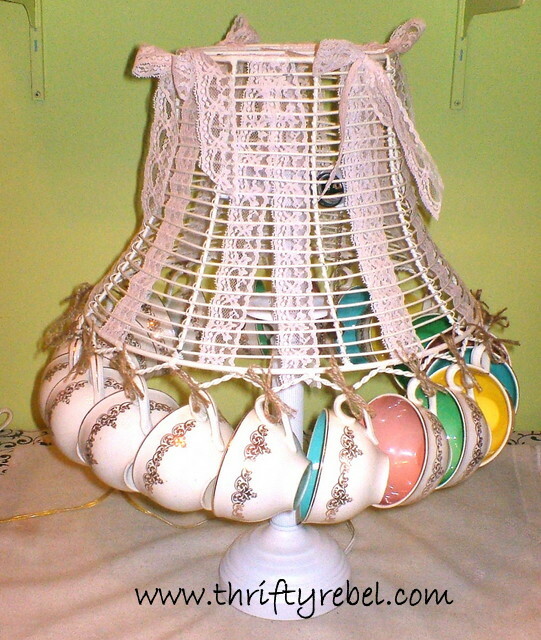 I truly love the tea cup lamp,I wish I had a wonderful imagination like you, you have made something beautiful out of items that most of us would have just given to good will. Keep making these wonderful projects.